Did you know that the food stamp EBT cards issued by DCF have an expiration date? Starting April 30, 2015 EBT cards will begin expiring, and new cards will be issued. To tell when your card is set to expire, look at the Good Thru date on the front of the card. Your new card will be mailed automatically at the beginning of the expiration month. So, if your card expires in May, a new card should be sent to you automatically during the beginning of the month. In order to receive the card, you should make sure that DCF has your correct address on file. One way to tell which address DCF has is to review your most recent Notice of Case Action. If the address is correct, you are probably okay, but if it is outdated, you should update your address with DCF by logging into your MyAccess Account online at www.myflorida.com/accessflorida and Reporting a Change. The new cards have an updated look, so it will be easy to tell which card is which. Your pin number will remain the same, so you can begin using the new card as soon as you receive it in the mail. Once you receive your new card, and verify that it is working properly, you may discard your old card. If you receive food stamps, you’ll want to pay attention to your expiration date, so that you know when to expect your updated card. If for any reason you have an issue with your new card, or if you don’t receive it even if you have a good address on file with DCF, you may call 888-356-3281 to order a new card. Tip: this number also works for lost / stolen cards, and cards that have never been received. You will be prompted to enter your card number during the call. If you do not know your number, stay on the line and you will be given additional prompts with options for requesting your card. Want to read more articles from AGED’s May, 2015 Newsletter? Recently DCF released a new SSI-Related Programs Financial Eligibility Standards Chart for July, 2014. This chart outlines the income and asset limits for various Social Security and Medicaid Programs. While this chart is released four times a year, generally changes made to the program limits are slight. However, this time around there was a big change with the Personal Needs Allowance (PNA) limit for people on the Institutional Care Policy (ICP), which covers Nursing Homes. Individuals on ICP are now allowed to keep $105 / month in PNA. The limit for couples has also increased, up to $210 / month. Previously these figures were $35 / month for individuals, and $70 / month for couples. This means that patient responsibility amounts will go down. If AGED is paying your nursing home bill on a recurring basis, please send us a new disbursement form with the new amount due to the nursing home so we can change the payment amount. For people on ICP, their patient responsibility for the nursing home is their income minus the PNA, so this change is significant for those individuals, who use this money for any additional items not covered by the nursing home. The chart changes several times a year, so you may wish to download the current version for your records. However, the web address for the chart doesn’t change, even when new charts are released. You may wish to bookmark the address so that you always have access to the most current chart. Want to read more articles in July’s Newsletter? Click here to read about Disaster / Emergency Planning for Seniors and Disabled Individuals. Or click here to read about AGED’s Guardianship Benevolent Fund Current Funding Status. It’s that time of year again – hurricane season. 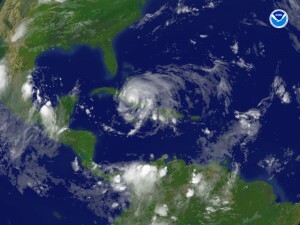 The Atlantic Hurricane Season runs from June 1st through November 30th. During this time of year, it’s a good idea to make sure you have extra supplies on hand, just in case. For seniors and disabled individuals extra precautions may need to be taken. Many counties have special needs shelters that provide basic medical care and monitoring for those in need. Most special needs shelters also allow for the individual’s pets to stay at the shelter, along with a caregiver for the individual if needed. However, in order to evacuate to a special needs shelter, you must be registered with the county prior to the emergency. It is important to note that not everyone with a disability requires a special needs shelter. These types of shelters are reserved for individuals with medical needs. If you do not meet the requirements, authorities recommend that the best place to shelter is in a safe structure outside the evacuation area with friends and family. • Nonprescription medicines that you might need, such as aspirin, antacids, etc. • Other special items needed, such as eye glasses, hearing aids, prosthetic devices, inhalers, thermometer, Do Not Resuscitate (DNR) papers, etc. Here are some numbers for local special needs shelters. If you do not see your county listed, an internet search for the Office of Emergency Management or Special Needs Shelter for your county should reveal the proper contact information. Click here to read about the Medicaid ICP Personal Needs Allowance Increase. 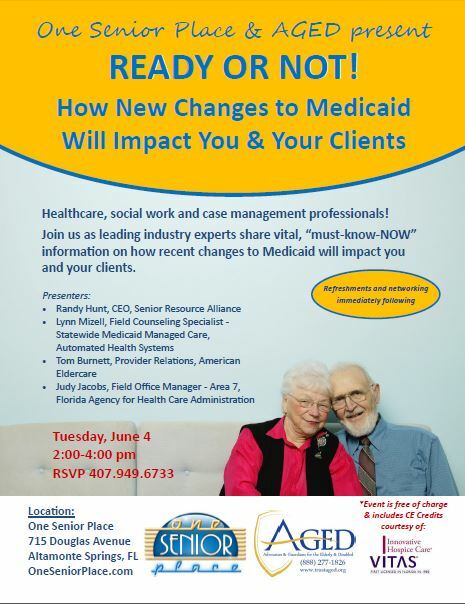 Presented by AGED: How New Changes to Medicaid Will Impact You & Your Clients. This event is for professionals only.